SUMMARY: We report a case of a 79-year-old woman with long-standing achalasia that resulted in respiratory stridor and dyspnea. She was evaluated for tracheal compression with use of CT on inspiration and expiration. Airway obstruction and acute respiratory distress secondary to achalasia have been reported in the clinical literature. The importance of recognizing these rare manifestations is crucial for the appropriate treatment of these patients. In this patient, the CT evaluation of tracheal compression provided useful information on the degree of narrowing caused by the dilated esophagus. Achalasia is a primary esophageal motility disorder characterized by the absence of primary peristalsis and failure of the lower esophageal sphincter (LES) to relax, resulting in a dilated esophagus. Most cases are of unknown cause and are therefore referred to as primary achalasias. Secondary achalasia refers to esophageal dilation that has a known cause such as infiltrating carcinoma of the lower esophagus.1 Achalasia is a rare disorder that can present in all age groups.2 Common manifestations of the disease include progressive dysphagia, chest pain, regurgitation, and weight loss.3 Although it is important to recognize these more common symptoms of achalasia, the clinician should also be familiar with the rare symptoms of stridor and acute respiratory insufficiency from tracheal compression by a severely dilated esophagus.4 We report a case of a patient with long-standing achalasia who had tracheal compression secondary to a grossly dilated esophagus. These findings are documented with inspiratory and expiratory CT scans. A 79-year-old woman with a history of achalasia and Lyme disease presented to our institution for radiographic evaluation. The diagnosis of achalasia was made 9 years earlier on the basis of symptoms of recurrent aspirations and difficulty swallowing. In 2000, the patient underwent a Heller myotomy with partial fundoplication at an outside institution. Her symptoms subsided for several years before she began to experience a recurrence of both dysphagia and regurgitation. In 2007, an esophageal evaluation was performed at another outside institution, which demonstrated a tortuous, sigmoid-shaped esophagus with proximal esophageal dilation producing distortion of the trachea (Fig 1). She was treated several times throughout the year with botulinum toxin (Botox; Allergan, Irvine, Calif) injections with diminishing response to each subsequent treatment. Her last treatment in spring 2007 produced almost a negligible result. 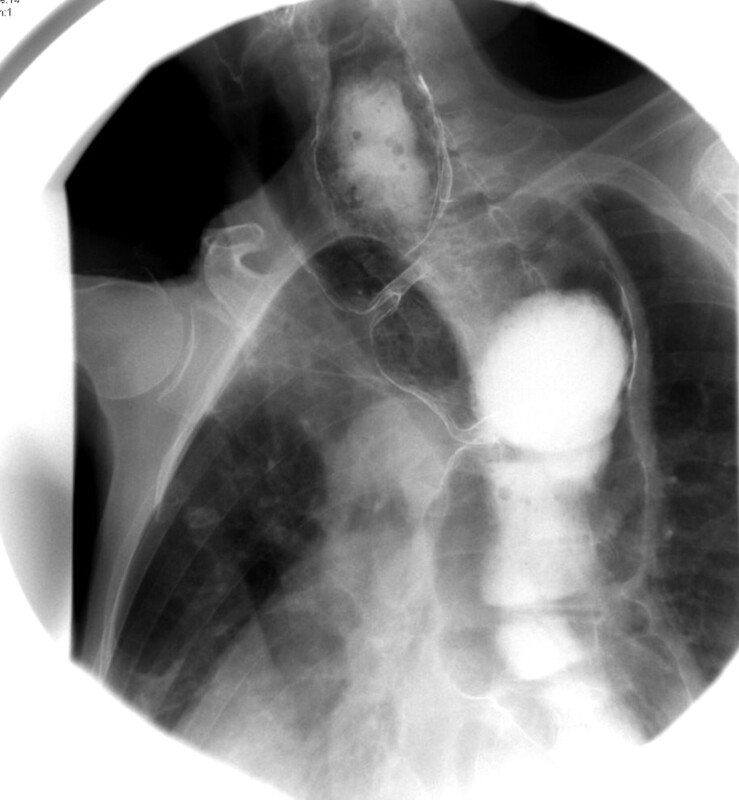 Left anterior oblique image from a double-contrast esophagram on a 79-year-old woman with known achalasia. There is massive dilation of the entire esophagus with anterior displacement of the trachea. The patient presented to one of our gastroenterologists in summer 2008 with a 6- to 12-month history of progressive dysphasia, 15-pound weight loss, periodic dyspnea, and dizziness. On physical examination, the patient was noted to have visible distension of her neck on deep inspiration. She was also noted to have occasional wheezing and stridor. The remainder of her examination was noncontributory. A CT study was obtained during expiration and during deep inspiration. The CT scans showed gross enlargement of the esophagus, which extended up into the lower neck, compressing the posterior tracheal wall and resulting in tracheal narrowing. The tracheal cross-sectional area at the most significant level of narrowing (tracheal inlet) was approximated by outlining the tracheal lumen on both expiratory and inspiratory images with use of the Vitrea 2 (Vital Images, Plymouth, Minn) software. The measuring tool automatically calculated a cross-sectional area of 219 mm2 on expiration to 177 mm2 for the defined region of interest. In this patient, we found that tracheal compression was approximately 20% greater on deep inspiration (Fig 2A–C). Axial CT image (A) just below the level of the cricopharyngeus muscle shows dilation of the upper esophagus without evidence of tracheal compression. Axial CT images at the level of the thoracic inlet obtained in the expiration (B) and inspiration (C) demonstrate narrowing of the trachea from a cross-sectional area of 219 mm2 on expiration to 177 mm2 on inspiration. Cross-sectional areas were calculated by use of the Vitrea 2 software. Massive dilation of the esophagus from achalasia leading to tracheal compression and respiratory distress has been reported in the clinical literature.15 Physical examination of patients who present with respiratory manifestations are typically based on findings of neck enlargement with inspiration and alleviation of symptoms in the supine position. The role of CT in the evaluation and treatment of patients with achalasia demonstrating respiratory tract symptoms has not been previously discussed in the imaging literature. In the case of our patient, the CT study demonstrated increased compression of the trachea on inspiration. This finding may be explained by the pressure on mediastinal structures during inspiration secondary to expansion of the lungs. This results in further narrowing of the trachea by an already dilated esophagus. Patients presenting with acute airway obstruction should be appropriately triaged, with management directed at stabilizing the respiratory compromise. These patients may require endotracheal tube intubation or emergency esophageal decompression.16 Long-term treatment options have included Heller myotomy, dilation procedure, esophagectomy, cricopharyngeus myotomy, and Botox injections.10,17 Our patient did not respond to the Botox injections and was not the ideal candidate for pneumatic dilation or surgery given her history of Lyme disease. Most patients with achalasia will present with dysphagia, chest pain, weight loss, and regurgitation. However, the few who experience tracheal compression manifested by stridor or respiratory difficulties should be quickly identified and treated appropriately. CT imaging may play a role in these patients to quickly and easily evaluate the extent of tracheal compression during inspiration and expiration. Approximations on cross-sectional areas of the trachea by software such as Vitrea 2 can further provide information on the degree of narrowing present. This information may help delineate the severity of airway compression and help guide clinical management. Accepted after revision August 25, 2008.